SoftPlanet makes it possible for everyone to get free Comodo IceDragon download directly from our servers. There is no registration needed for downloading. Comodo IceDragon 26.0.0.2​ is a much more secure and faster Web browser than most other famous programs in this category. Based on the Mozilla Firefox core, it upgrades the features and the performance of its well-known predecessor. 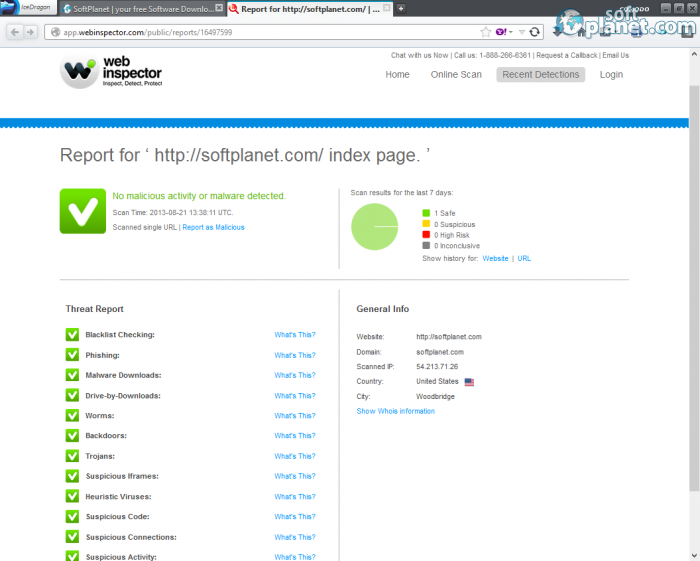 It is the only one, which has page scanning using the Comodo Web inspector. 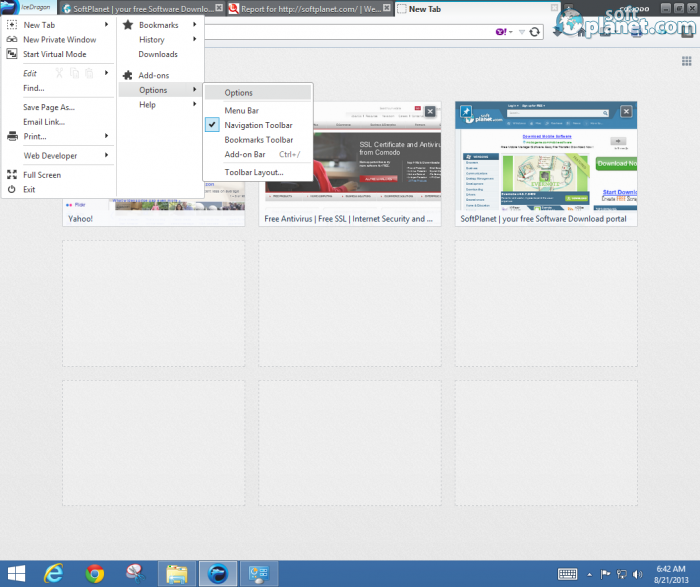 Also all the Firefox plug-ins and extensions can be used with it. Comodo IceDragon is a browser, which can import all your history, favorites, cookies and passwords from your default browser. However, the check mark to make it a default browser is inactive only if you select the portable version installation. The service of the secure DNS servers is available only with this program and it is optional. One of the best features is the social network integration. The system requirements are medium and users can install it on any Windows XP, Vista, 7 or 8 PC. 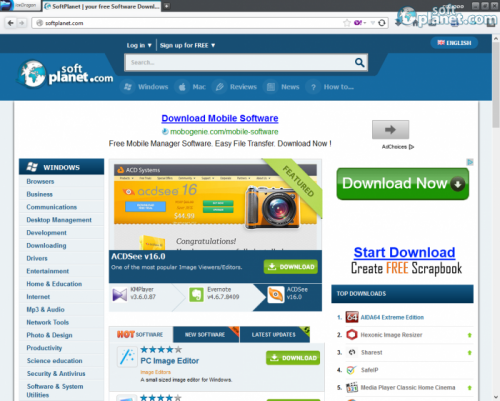 Comodo IceDragon has a user interface that is very similar to the Mozilla Firefox user interface. The main button, through which most of its functions and options are available, is located in the upper left corner and has the program icon and name on it. Next to it the browsing tabs of the opened pages are located. The address bar and the Back and Forward buttons are underneath. The All Downloads, Home, Bookmarks, Facebook, Scan and Virtual Browser icons are situated on the right. 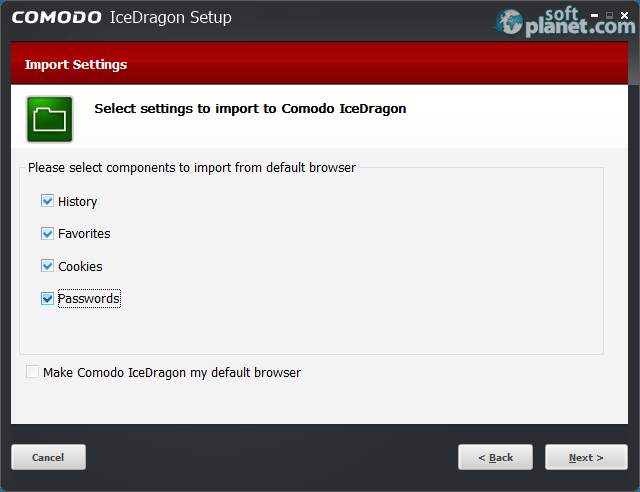 To get to the Comodo IceDragon Options, you have to click on the icon in the upper left corner and from the drop-down menu select Options twice. Also you can visualize the Menu bar, the Navigation and Bookmarks toolbar and the Add-on Bar there. When a new page is opened, the latest and frequently used website grid can be hidden by the little icon in the new page window. We decided to use Comodo IceDragon 26.0.0.2 on one of our test stations and we were nicely surprised by the way the browser performed all the time. During the test we had numerous opened web pages, listened to a web radio and watched many live video stream sites. In addition, the program did never crash or freeze and had no problem with the web sites, which require Java or Flash. In conclusion we strongly recommend you to download this free and secure web browser and enjoy its features. Our security scan shows that Comodo IceDragon is clean from viruses. The current version of Comodo IceDragon has been scanned by our system, which contains 46 different anti-virus algorithms. That ensures that Comodo IceDragon 26.0.0.2 is 100% safe for your computer.